Blogs originally started out as journals and diaries, which is why posts and articles are shown in chronological order, from newest to oldest. Primarily, every blog I’ve come across has been set up in this manner. Articles or blog posts are displayed starting with the most recent post which has been published, followed by the next recent post, and continue on in that order. Posts are shown with their title displayed first, followed by the articles content. This is commonly known as the “journaling” format, and has been the formatting of blogs since the beginning of blogging. The term “blog”, which today is considered to be the politically correct terminology in our society and the blogging world. 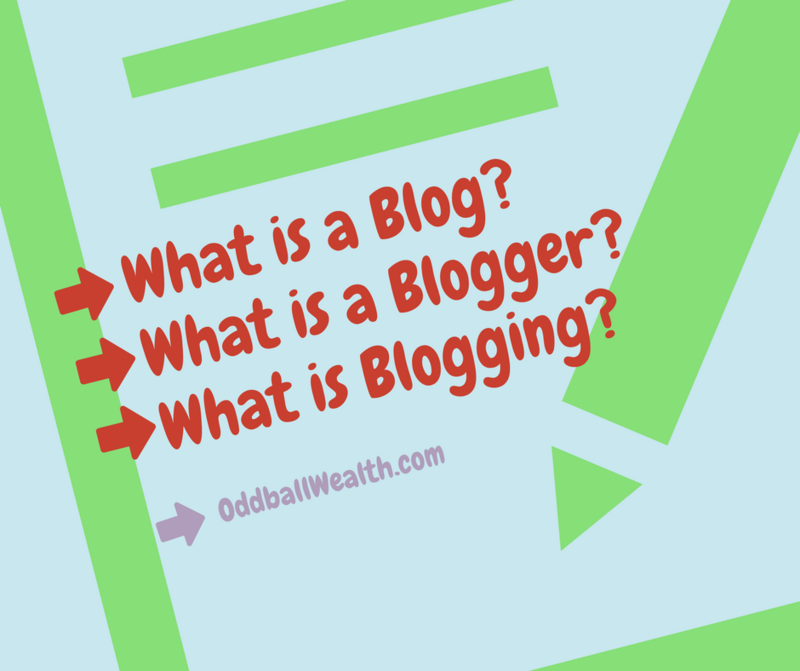 But, the term “blog” was originally considered to be slang and a made up word by bloggers. The term blog is actually short for the word “weblog”, and is actually the original term for an online journal or diary. A journal has entries displayed with the most recent entry date, just as blog posts do. Over the years, blogs have revolutionized and changed dramatically. They’re no longer considered to be only journals or personal diaries. In other words, blogs are no longer just about the author and his or her personal life. This is important to understand because most people who are not professional bloggers still think that a blog is nothing more than a personal diary. When people ask me what I do, and I try explaining to them that I blog. Often times, I get many blank stares and confused looks. This is because they associate the term “blog” with a personal journal or diary. In fact, when people visit a website, many times they don’t realize that the website they’re visiting is actually a blog. Although, there are still some blogs primarily focused around the thoughts and ideas of the blogger (author) themselves, blogs can be about virtually anything. A blogger (or author) all have their own unique styles and forms of writing. Some write about personal experiences or opinions, others write in an academic or factual style, while some use a combination of both. Regardless of the author(s) style of writing, it has to align with the needs and wants of their target audience and readers if they want to be successful. Traditional websites, otherwise known as static websites made it very difficult for regular people to develop a website, simply because it was way too technical and complex of a process. This created a barrier to entry for anyone without advance web development and coding skills. When I started my first blog, I had zero experience when it came to web development. But, thanks to web hosts like Bluehost and content management systems such as WordPress, it was actually pretty simple for me to create my own blog. Overtime, I would acquire and learn more advance web development and design skills. This allowed me to build a more tech savvy static home page and web pages to give my blog a more professional look. These more advance skills were all acquired over time and through experience. One big way in which blogs have revolutionized the web is this – A regular person with little to no experience can create their own website and have it live for the world to see in under an hour’s time. It’s fairly simple to do, which is why I’ve created free step-by-step guides and tutorials here on this site to help anyone who wants to start their own website or blog. Traditional websites, technically known as static websites, have one major unappealing characteristic about them, which is that they’re “static”. Static in the online world means that it doesn’t change or is rarely updated. This was how traditional websites were originally set up and designed. They were boring and sometimes their content would become irrelevant because the content always stayed the same. Static websites would rarely ever be updated. The reason for this was because traditional websites were very technical, making it extremely difficult to update them and the content. It required an advance technical skill set and coding skills, not to mention the amount of time and money it took to do so. Of course back then, there were still popular major media sites which frequently added new and updated content to their sites on a timely basis before the blog revolution. But, these were large and established companies and organizations with unlimited financial resources who had a large technical team and professional staff of writers on hand to make that happen. Before the existence of blogs, it was extremely difficult for the average person with limited financial resources or advanced set of technical skills to publish their own ideas and content online. Once blogs came around, it allowed anyone the ability to write and publish their own content and do so as often as they wanted. Thanks to what I call the “blogging revolution”, today blogs have established themselves as some of the most well-known and visited websites on the world wide web. Many bloggers post fresh content multiple times per day and because blogs can consistently have new and updated content, their popularity levels have sky-rocketed! Search engines like Google favor blogs over the more traditional static websites because of the fact that blogs add new and fresh content regularly, making blogs more relevant and more appealing to readers. As a result, major search engines reward blogs by giving them favorable rankings in search result listings. Another dramatic way blogs have changed and revolutionized the internet world was in their ability for any person to reply and a comment under the published content. This may sound silly, but this was the start of the social media revolution. Thanks to the comment sections on blogs, websites could now be used as a tool for two-way communication. This allowed blogs to form communities and loyal followings. Readers were able to communicate with the author directly about the particular piece of content that was published, hold conversations, and carry-out long lasting relationships. Once commenting on blogs was created and allowed readers and authors to interact with one another, every piece of content that was published on the internet could be turned into a conversation. Blogs and bloggers with clear and sincere content are considered to be trusted resources and sources of information. This is because of the ability of the author and reader to communicate with one another and form relationships. Regardless of background, education, and qualifications, many bloggers who have niche blogs focused around a specific subject are considered to be experts or authority figures in that topic or niche, simply because of the success of their blog and website. If you have a platform that can reach and motivate people, then you have formed a solid foundation for building a business. When your audience and readers trust you, then they’ll be happy to purchase any product or service in which you promote or recommend to them. Nice article. I didn’t know the real history of a “Blog.” Not to mention, I have been trying to encourage my husband to write a blog. I call him a “word smith.” He can really write, not to mention he has knowledge he can share. Well…maybe someday. Thanks for imparting your knowledge too. Don’t feel bad, most people don’t know the history of blogging. That’s why I like to mention little history facts about blogging from time to time! If your husband is a good writer and has a lot of knowledge to share, then he fits the blogger profile perfectly!